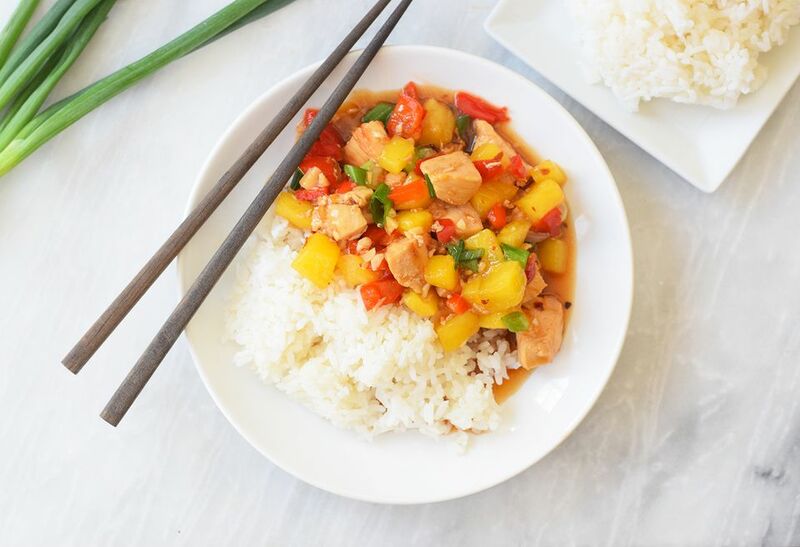 Sweet, savory, fresh, fruity, and oh so craveable...this pineapple chicken stir fry will be your new favorite weeknight meal! The pineapple adds the perfect little bit of sweetness and the garlic and crushed red pepper make it a garlicky and a little spicy. Some red bell pepper and scallions round out the dish. This stir fry comes together in no time and is a complete meal in one pan. Serve it with some white or brown rice and top it with chopped peanuts for crunch. Add the oil to a saute pan or wok. Heat on high heat and add the chicken and half of the garlic. Do not disturb the chicken and let it cook on high heat for about 3 minutes, or until browned. Stir the chicken, rotating it to the other side to brown. Add in the diced onions. Cook them together stirring occasionally until the onions are softened and the chicken is cooked through. Put the cornstarch, ginger, red pepper flakes, and remaining half of the garlic into a small bowl. Gradually whisk in the soy, broth, vinegar and brown sugar. Add the sauce to the pan and cook for two minutes, or until the sauce is thickened. Toss the diced pineapple and chopped bell pepper into the chicken and sauce. Stir it until they are coated with sauce. Top it with scallions. Stir and cook for another minute or two. If you want the bell peppers softer you can toss them in with the chicken while it is cooking or cook the entire mixture for longer. Serve with hot rice, more scallions, and crushed peanuts or sesame seeds if you wish. You can serve this stir fry with white or brown rice. You can also serve it with rice noodles or regular noodles. You can also try it with zoodles, which are zucchini noodles made from spiralizing the whole zucchini. To make your life easier you can use frozen, prechopped bell peppers. you can really use any color you like. You can also buy frozen, diced pineapple too, so you don't have to peel and core the pineapple yourself!